J. Hoberman is one of the world's most erudite and perceptive film critics, with writings that combine deep historical knowledge with an expansive view of cinema. 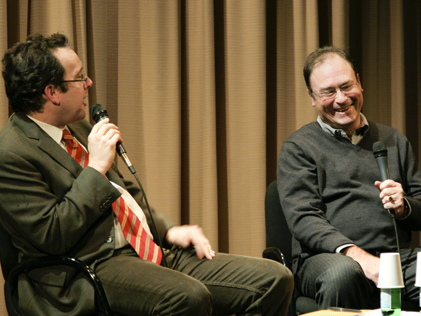 To celebrate his 30th anniversary as a film critic at The Village Voice, the Museum of the Moving Image presented a program including a conversation with Hoberman moderated by New York Times film critic A. O. Scott. David Schwartz, the Museum's Chief Curator, introduced the evening with a Top-10 List of things to like about Hoberman, and the discussion was followed by a screening of Julia Loktev's independent feature Day Night Day Night, one of Hoberman's favorite films of 2007.